The Merdeka square lies in the centre of Jakarta and measures 1km x 1km, which makes it one of the largest squares in the world. At its centre lies the National Monument (also known as Monas), a 132m tall tower built between 1961 and 1975, from which there are good views of Jakarta. 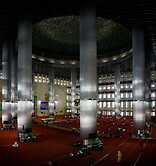 To the north of Merdeka square lies the Istiqlal mosque, the largest mosque in southeast Asia with a capacity of 120000 people. The mosque was built between 1961 and 1978. The design of the mosque is rather simple and not as beautiful as that of mosques in the Middle East. The Jakarta catholic cathedral is located opposite to the mosque. It was consecrated in 1901 and is built in Neo-Gothic style.